Auroras: What do they look like from space? Auroras seem to spread and sway across the sky above us. 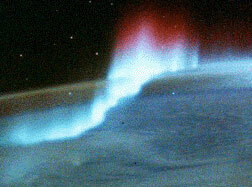 But to astronauts in the space shuttle above the earth, auroras seem to cling to the surface below. In fact, auroras begin at about 60 miles above the Earth's surface, above most of the atmosphere. Imagine: if you could "drive" from the surface to the bottom of an aurora, it would take you an hour at 60 m.p.h.! The space shuttle, in its "low earth" orbit 250 kilometers above Earth's surface, is a great spot for observing auroras from above the polar regions. This photo, taken from the shuttle, shows red-tipped arcs near the south pole. In the next section, we'll look into where the different colors in auroras come from. This shuttle image shows the characteristic oval shape of the aurora. What Do Auroras Look Like From Space? Listen to Maurico Peredo of NASA's Goddard Space Flight Center. To Listen to this clip you will need the RealAudio player. Auroras form in rings centered over the Earth's magnetic poles. During an aurora, rings form around the North and South poles at the same time. Even near the poles, someone on Earth can only see a tiny section of the auroral oval. Look at the satellite image of the aurora borealis to the left. Notice that the center of the auroral ring is not on the line between the day side (orange) and the night side. This is because the rings center around the magnetic poles, not the geographic poles, which define the Earths' axis of rotation. The aurora looks orange in this image, but the shades of orange represent the intensity (brightness) of radiation at wavelengths we can't see. You can see that in the image more of the activity seems to be on the night side of the Earth. 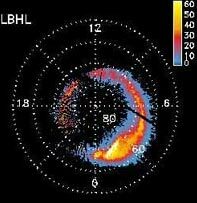 But there is no reason for auroras to happen on the night side rather than the day side; they are just more visible to the satellite's instruments. The most active part of the ring moves as the earth's magnetic field shifts. The field shifts because of changes in the solar wind, and also because of the currents that cause the aurora. Here is a spectacular movie of an aurora, in which you can see the auroral ring changing shape It was made from satellite images using far ultraviolet light. 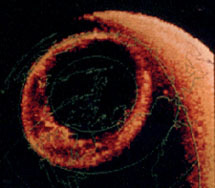 Can you imagine how people could learn about the auroral ring, before there were satellites? Caution: This is a large file and may take some time to load for browsers with slower connections. Auroras give off more than just visible light. 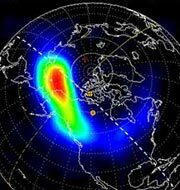 Satellites now look at many different types of light emitted by the aurora. Below are satellite images of ultraviolet and x-ray light emitted by the aurora borealis. In the left picture, yellow shows the most intense areas of UV light. The red area in the right image shows the most intense x-ray activity. The images were made by two of the instruments on the POLAR satellite. Blue areas are the least intense in both images. Image from the PIXIE x-ray instrument. You may have recently seen one like it on the cover of DISCOVER magazine. If you would like to see other examples of images of auroras from space, check out: Lights Below: The Aurora from Space at NASA's Goddard Space Flight Center.